On the eve of Mawled An-Nabi, once again we met the treacherous face of terrorism. 38 security personnels were martyred in a treacherous ambush, 155 lives were injured. Citizens reacting to terror by hanging Turkish flag on their homes, work places, cars, opened their hands to unity and solidarity of our country in the mosques. Orphans and painful families remained behind our martyrs. Bezmialem Valide Sultan Mosque's windows, which were located next to the stadium due to the explosion in Beşiktaş, were broken. Istanbul Müfti Muhammad Rahmi Yaran, who came to the Mosque and participated on researches. The images of a suicide bomber that blows itself up in the Macka park are reflected in the camera of a moving car. The terrorist who appears on the images alone is seen clearly. Due to attacks in Istanbul , Turkey declared one day of National Mourning across the country. After the treacherous attack that took place in Beşiktaş, thousands of citizens gathered in front of the Dolmabahçe Mosque with their Turkish flags on their backs, condemning terror with "unity march" by the invitation of Civil Society Organizations. 30 policeman were martyred in Istanbul attack. The names of 20 martyrs were announced. 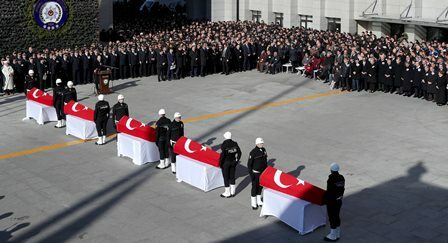 Vefa Karakurdu, polis memurları Okan Doğan, Mehmet Zengin, Ali Aksoy, Adem Oğuz, Adem Serin, Mustafa Öztürk, Süleyman Sorkut, İlker Uylaş, Durmuş Öcal, Yasin İke, Soner İdil, Murat Yılmaz, Kadir Yıldırım, Mehmet Atıcı, Metin Düzgün, Hasan Bilgin, Hamdi Dikmen, Bora Çelik, Oğuzhan Duyar şehit oldu. Hain saldırıda şehit olan siviller ise, Velat Demiroğlu, Berkay Akbaş, Tunç Uncu.